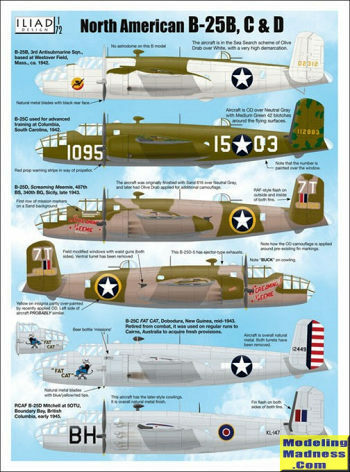 This next sheet from Iliad Designs covers the B-25B/LC/D and is quite timely thanks to the very nice Airfix kit that was recently released. Of course, you could also use the Italeri kit for this. There are five options provided. First up is a B-25B of the 3rd Antisubmarine Squadron base in Massachusettes in 1942. This wears the sea search camouflage of OD over white. Next is a trainer from a unit in Colombia, South Carolina during 1942 in standard camouflage. This is an early B-25C with the collector exhaust. 'Screaming Meemie' is a B-25D that was originally in sand over neutral grey and later had areas of OD painted onto it. This plane was with the 487th BS/340 BG and based in Sicialy in late 1943. This aircraft has the early ejector exhaust without the fairings on the cowling. Note that the lower turret appears to have been removed and faired over. 'Fat Cat' was an aircraft retired from combat and used as a transport to collect provisions on the Australia to New Guinea run in 1943. This C model has all its paint and guns removed. Collector style exhaust. Also unpainted is a B-25D of the 5OTU at Boundary Bay in British Columbia during early 1945. It has also had all its weapons removed. Later ejector exhaust with the fairings on the cowlings. 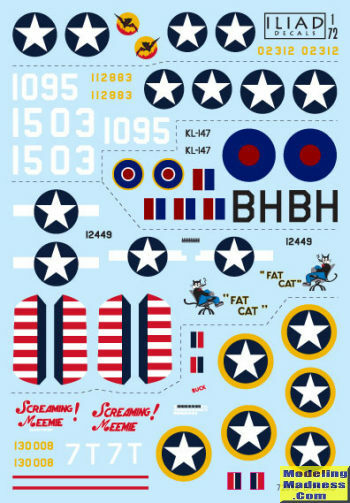 Decals are very nicely printed and Iliad Designs has superb instructions showing the top views as well.